The three baby birds are squawking to their parents, Leonard the gray jay and his mate, until the timer trips the valve, starting ten minutes of spray. It fills the plant saucer while the babies, as large as their parents and capable of flying short distances, crowd into it. They drink and fluff in the over spray. I may have seen a small or young mountain lion across the street last night, calmly walking down the sidewalk to where the road turns right over the I-5. Straight ahead, a trail of a city sidewalk is obscured by dense conifers and barricaded by two tiers of guard rail. Once down a steep dirt trail, it runs parallel to the freeway over-grown with wild chicory, fennel, sweet pea, ceanothus and elderberry. I spend most of the day developing story themes, inflating characters with inspirations from the re-reading of Boris Pasternak's Dr. Zhivago. I am stunned by Pasternak's craft of word smithing and character arc, also the subtleties of the inter-woven complex cast of characters in his 1905 to post revolution 1917 Russian masterpiece of love and humanity torn apart by war. The squeals and shouts from the municipal pool across the way, the sound of summer. Two trips to the same area, the drainage of the headwaters of the Rogue River, encompassing Union Creek in the south, dominated by Crater Lake, and Diamond Lake to the north, occupied most of August. I drove through completely burnt over sections on highway 97 near Talent, still smoking and tended by squads of firefighters, but at least the highway was re-opened! Twice I hiked the trail to the lake inside the crater! The lake is, of course, an extinct volcano. The soil around the lake is very unstable. A sign on the side of the road says, "You fall You die!" The National Park Service does an outstanding job maintaining the park and making it safe for the thousands of visitors from around the world who manage to find this jewel. The surface of the lake is at 6173 feet elevation or 1882 meters. The deepest point below the water line is 1943 feet or 592 meters. The Cleetwood Cove trail, the only one down to the lake, is considered strenuous in the difficulty section. It is 2.2 miles or 3.5 meters long, round trip, with 760 feet or 232 meters elevation gain. They say, at more than 200 feet or 61 meters, the lake water stays 38° F or 3° C year-round. Our resort is a genuine historic district listed on the US National Register of Historic Places for rustic structures dating to the 1930's when the CCC Civilian Conservation Corps built them. I attest they are cute as can be with wide board flooring but with a microwave, small refer and a shower with lots of hot water. My granddaughter, just 5 years old, caught her first trout in the Rogue River, three trout!, using the same pole and reel her father had used as a tyke. S"mores and campfire stories until late in the night. It's camp stove cooking with sleeping in a comfy warm bed at night. Some cabins have kitchens. We had a blast. Highly recommended! While fishing along Union Creek after breakfast on the camp stove, toasted cheddar whole-wheat bagels with cream cheese, watermelon, bacon and tomato omelet, yogurt and tea, we discover a geodetic mark, a benchmark for the National Geodetic Survey which placed marks as part of triangulation surveys done in the 19th Century. They can be cast metal disks with stamped information set into rock ledges, tops of pillars or pipes sunk into the ground. That must have been the case with the one we found in the middle of the trail. The Window Box Bonsai Accents & Art Gallery packed up and drove to the REBS Redwood Empire Bonsai Society annual show at the Santa Rosa Vets Auditorium. I met so many of my friends although it was my first vendor show. I visited this same show in 2009 with Kathleen O'Donnell, former editor of Golden Statements, when I wrote a couple articles about Sebastopol and the club. 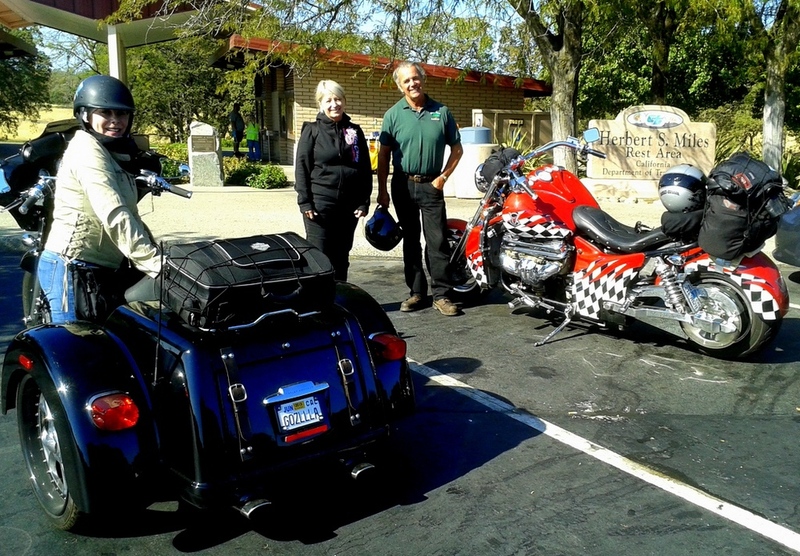 Awesome rides seen at rest stop at Red Bluff. Check out the corvette flag motif design on the bike with a corvette engine!! Editor of Golden Statements, George Haas, suiseki maniac, Ken McCleod, and bonsai journalist, Cheryl Petty, plan to search for giant sierra junipers this fall. 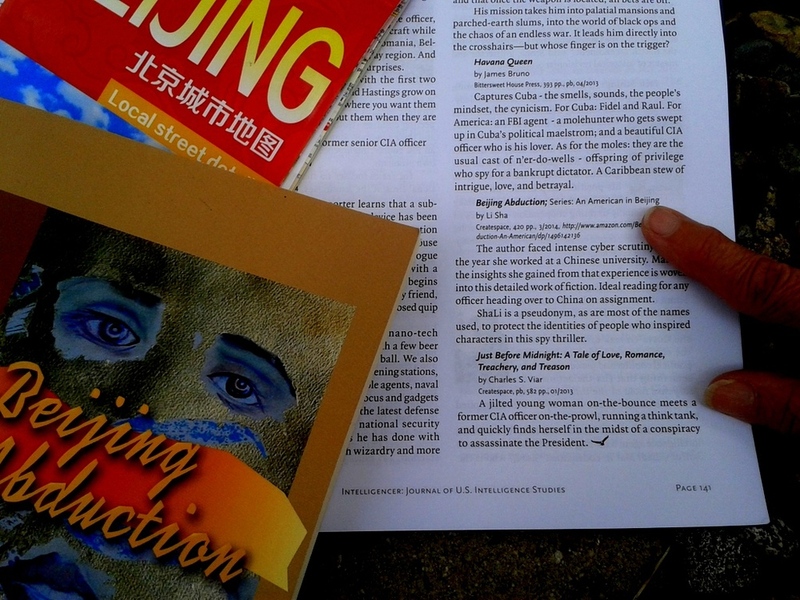 The Intelligencer, the Journal of US Intelligence Studies, volume 20, Number 3, Spring/Summer 2014, printed a review of Beijing Abduction, the first volume in a four-volume series An American in Beijing. The author faced intense cyber scrutiny during the year she worked at a Chinese university. Many of the insights she gained from that experience is woven into this detailed work of fiction. Ideal reading for any officer heading over to China on assignment. The English edition of Bonsai Focus, 129/152 4/2014 Jul/Aug, the premier global bonsai magazine, published in Spanish, Italian, French, German and Dutch and edited by photographer Farrand Bloch, printed my interview of Master Chen Zhi Jiu in Guangzhou last November. Friend Bonsai Focus on Facebook and you will receive almost daily morsels of gorgeous trees. Petty holds "Night Yard," above "Sunset Oaks," "Julien Ranch Squaw Creek," and "River Willows." 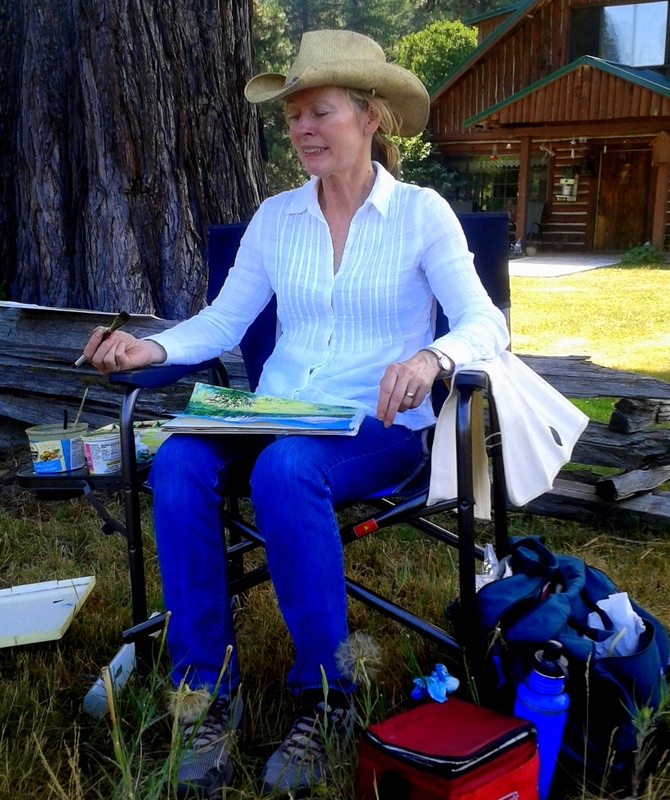 INTERPRETATIONS: Artists Painting Side by Side in Siskiyou County Plein Air ends September 14. 418 N. Mt. Shasta Blvd., Mount Shasta, CA 96067. Five artists: Dorothea Schoenstein and Cheryl Petty– Oil Landscapes; Rebecca Chandler –Recycled Carpets; Kim Guthrie and Elizabeth Anderson Watercolor Landscapes, have been painting together thru out the summer at various locations in the county. They diligently worked side by side on hot summer days, and sometimes rescued art that got blown off the easel from a sudden gust of wind. That wind actually ended the painting day for them because it didn’t stop. The debris that swirled up at the Julien Ranch combined with Dorothea Schoenstein’s oil painting causing her to spend an hour plucking fine pieces from the canvas with tweezers. Some days were very hot, especially at the Bob Gray Squaw Valley Acres. Elizabeth Anderson’s watercolor was drying too fast. Another day the group was rained out and so they sat in a local coffee shop sharing ideas about art. But this show is about what did happen on those successful days. Each artist interprets the landscape differently, utilizing different mediums and different supports. Some artists use thick paint, others paint thin, some work with bright colors, while others work muted. Impressions of the landscape and interpretations of the view are all in this exhibit. McCloud ARTS Society, in partnership with the Siskiyou Arts Council (SAC) has been sponsoring the plein air painting days. If you or a friend is interested in painting outdoors with us please contact Dorothea Schoenstein at dschoensrt@frontiernet.net. The McCloud ARTS Society was started in 2012 with a grant from the California Arts Council as part of CAC’s Creating Public Value Grant. Visit the gallery and support our local artists, the gallery is open Wed thru Sat 12-4 pm. 18 N. Mt. Shasta Blvd., Mount Shasta, CA 96067. Cornfield and eucalyptus along I-5.